Ovcha Kupel is a tranquil green area, with many detached family houses, 6 kilometres west of the city centre. 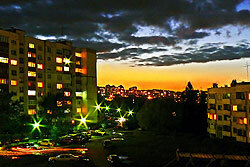 It has an inspiring panoramic view of the Vitosha Mountain. It’s quite easy to get around Ovcha Kupel and its main neighbourhood (known as the “old” Ovcha Kupel Quarter). The municipality is home to a 30,000 seating-capacity stadium and one of the oldest football clubs in Bulgaria, Slavia Sofia. It also has a number of universities, including the New Bulgarian University.